What a good campsite. Had a very peaceful sleep and a great hot shower this morning. I was riding at about 7.30am. The weather is a little overcast, slightly cool and no wind. Perfect for riding. My first part of the ride took me over very gentle rolling hills. 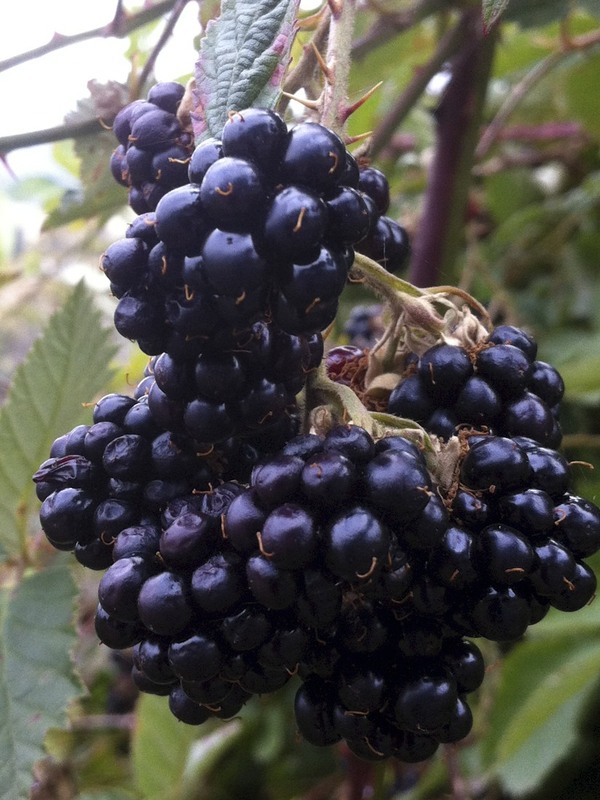 Pass farms and orchards. There were also plenty of spots for me to stop and pick and eat blackberries. Yummy. 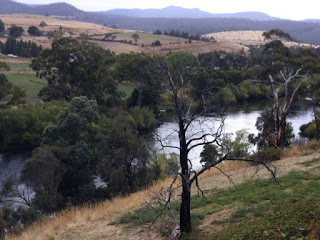 I then started to follow the Derwent River. This will take me right into the heart of Hobart. So I have a new riding partner for today. About 35km I got to my first big town for a long time, New Norfolk. So I stopped here for coffee and breakfast. This town has all the familiar sights of any major town. It is also the first time I've seen a McDonald's since arriving in TAS. After breakfast I crossed the river and took the B10 for a part of the way. This road is a little quieter than the A10 on the other side of the river. Once I got to Bridgewater I crossed over the river again and followed the bicycle signs. This avoids riding on the main roads into Hobart. I was going to go to the Cadbury factory to buy some chocolate, but it isn't open on the weekends. 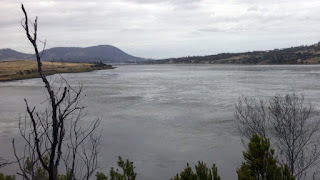 So instead I continued my ride through to Hobart. 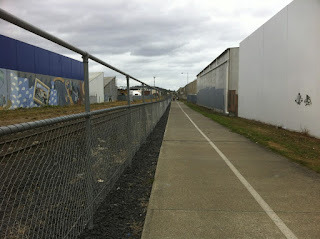 Not far from the Cadbury factory there is a shared bicycle path which follows the rail line into the CBD. It is certainly a great way to get into the city. I didn't need to ride with traffic for about 18km. 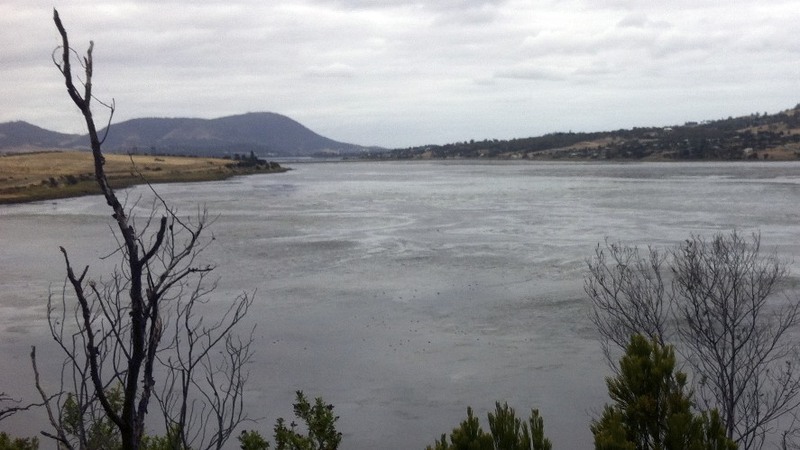 Once I got to the waterfront of Hobart I headed to the Pickled Frog Hostel. This is where I'm staying for the night. 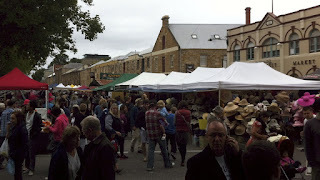 After I got cleaned up I went for a walk to Salamanca markets. Which are about a 10 minute walk from where I'm staying. Salamanca markets is on every Saturday and is a major drawcard for Hobart. There are lots of locally produced products and food. So I got myself some lunch. I started with a savory crepe, followed by a big German hot dog, followed by yummy coffee, followed by a large custard donut. So much fun being in a big town again with lots of yummy things. After lunch I had a walk around the harbour to the Tasmania museum. They had a really good exhibit about Antarctica and the people who have travelled there. I then had a walk around the CBD and back to the hostel. Tonight I'm hoping to go out for dinner. It'll make a change from pasta or baked beans. Tomorrow, if the weather is good I'm going to have a ride around Hobart as my flight back to Sydney isn't until the evening. One more day and then the lap is complete.